Death of Monopoly: More Dominion cards!!! Ironworks lets you gain a card worth a value of up to four. As well, if you gain a action card, take another action. If you gain, a coin, add +1 for your buy. If you gain a victory point card, then you get to draw another card. Um, very cool and adds some more decisions to the play of the game. 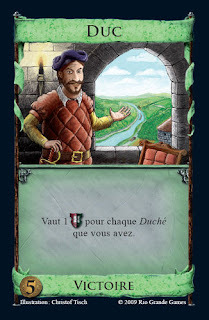 Each Duke (much like the Gardens) is worth the same number of points as there are Duchys in your deck at the end of the game. Hmmmm... These could be worth more than provinces if played right. Interesting. 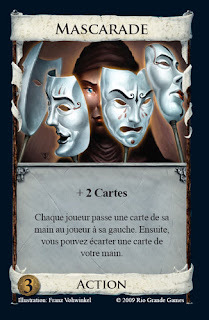 Ah yes, and the coolest/weirdest one so far, the Masquerade. The player of the card draws two cards then EVERYONE passes a card to the left. After that the player of the card may trash one card in their hand. Oh this will be fun with Curse cards from the Witch!!! Okay, getting excited for the new set of cards. 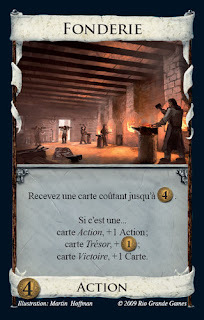 As you can see and so we have heard from the playtesters, the new set provides a lot more decisions with each action card and of course can be combined easily with the original. I think we'll be playing this game for years to come. The only thing I'm worried is the Romanian taking even longer with his turns. Oh well, it'll be worth it. I think the Italian has been taking much longer turns than the Romanian in the last few games! The announcement appears set to fulfil the promise made by HTC America President, Jason Mackenzie, at the time of the HTC One A9's launch. When launched in October, Mackenzie promised that the unlocked HTC One A9 would receive every Android update within 15 days of the Nexus range. It is worth noting that HTC One A9 was launched running Android 6.0 Marshmallow out of the box. Some staffers credit Barbara with getting George to suddenly pledge cleaner campaign tactics at a fund raiser last fall at Bob Hope Hollywood spread. The announcement so stunned aides that shirts with sayings they disappeared on purpose eclipse t shirts afterward. But Barbara wasn all softball.